Woodbury Lions Club members Carl and Patsy Hirlston give Janet Greco, Family Room Volunteer at the Children’s Critical Care Patient Waiting Room at Vanderbilt Children’s Hospital a bag containing over 10 pounds of aluminum pull-tabs. 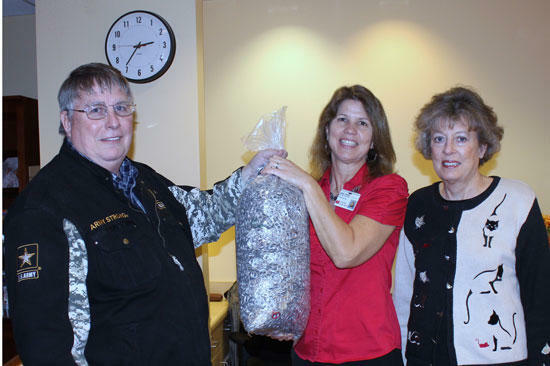 A few Woodbury Lions Club members started collecting aluminum pull-tabs to donate to Vanderbilt Children’s Hospital. Lions Carl and Patsy Hirlston had two grandsons who were practically raised at the Children’s Hospital the first five years of their lives. Many times they were in the Critical Care on the 5th Floor. Visiting hours were limited and many hours were spent in the Waiting Room. The Waiting Room always had drinks, food, and snacks that were provided by Ronald McDonald House Charities of Nashville. Donations for the items was asked for but not required. The Hirlston’s learned that people would donate aluminum pull-tabs, the tabs would be recycled and the monies collected would pay for the items. Last year alone, the money earned from recycling aluminum tabs was just over $10,000. The Ronald McDonald House (a few blocks from the hospital) has 32 families every night of the year who call it “home” while they have a critically ill child being treated at a local Nashville hospital. The Ronald McDonald Family Room’s numbers continue to grow with each year and they are averaging approximately 3,500 visitors each month. The Hirlston’s started collecting the tabs at the American Red Cross Blood Drives that the Woodbury Lions Club host. Other Lions Club members noticed and when told why, they started helping out. Lion Christopher Brushaber, who is also a member of the Cannon County Emergency Rescue Squad, started bringing in small sacks that he collected with the Rescue Squad. Lion Mike Smith who is at NHC in Murfreesboro, who had been collecting them for several years from the machines at NHC, gave his up to the Hirlston’s when visited. Other Lions: Bobby Bogard, Ken and Artie Jean McIntyre, Glenn Steakley, and Charlie Brown along with blood donors would bring in a few at each blood drive. How much cash is a 10 lb bag of pull tabs worth? Thank you Carl & Patsy for making everyone aware of this worthwile service. This is a great work. I save mine but didn't know where to turn them in, now I do.